I saw Stones for the first time in Aarhus, Denmark, in september 1970. Over the years I have seen them 8 or 9 times, so my wife and I had to take the ferry to Norway for the concert in Oslo. Is was just great (but a bit sloppy in the first numbers). But after that - what a show. I will not comment on the harsh times for Mick Jagger, that is private for him. But beside that, I noticed that Keith was in full harmony with the music, and the interaction between Keith and Mick was touching to see. And for me very nice to se Mick Taylor up there. I will not write more than this - it was all just beyond words. 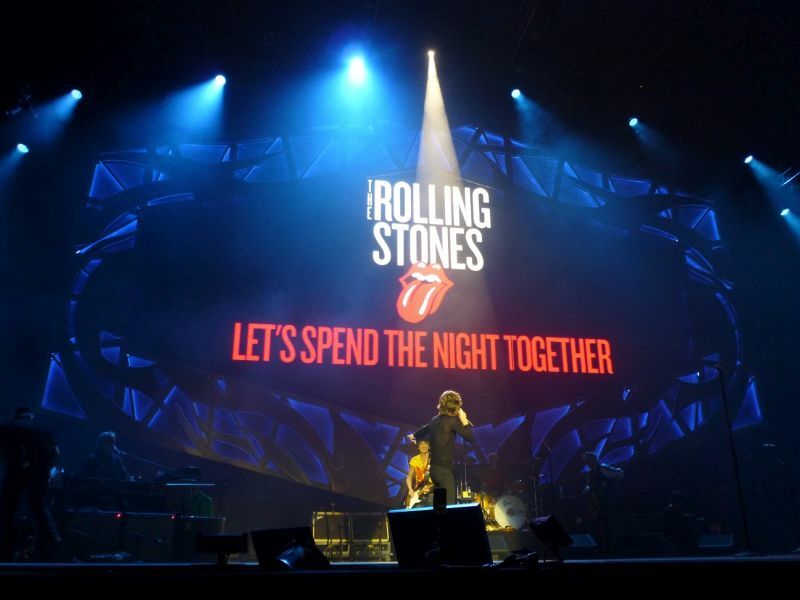 To the band - thanks for everything in all those years..
After eight days in Oslo, with lots of rehearsals, the Stones finally entered the stage in Telenor Arena Monday evening. And what an entrance. 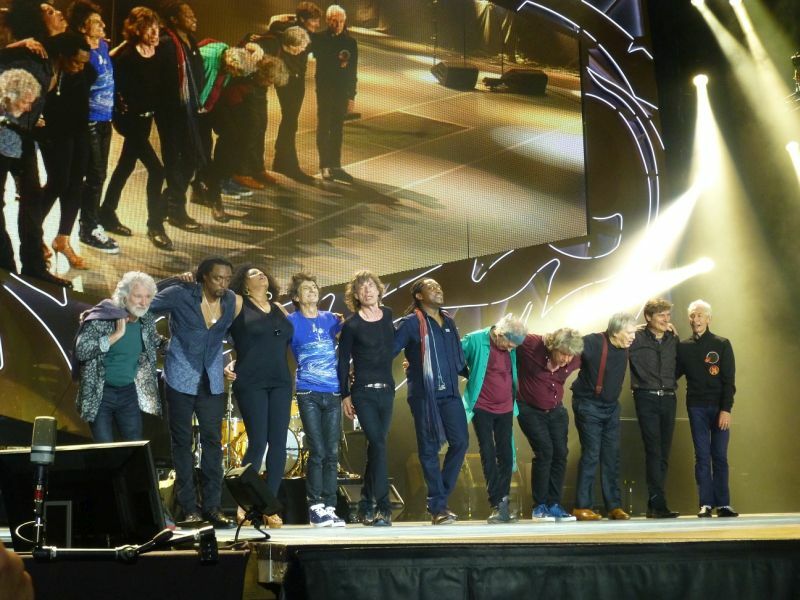 From the opening riffs of Jumping Jack Flash, to the last tones of Satisfaction the band really proved what it is like to be the greatest rock and roll band in the World. After Jumping Jack Flash, It's Only Rock and Roll, AND WE LOVE IT!!! Then All Down The Line, where ironically Ronnie copied the solo note for note from Exile On Main Street - with the original guitarist, Mick Taylor, probably smiling somewhere behind the stage. Keith obviously doesn't want to stop the song, he just continues to hammer out the riff to great pleasure for the crowd. Then another Exile-song, Tumblin' Dice, before the roadies bring out the stage piano for Worried About You. I've always loved this song, and it works great in Telenor Arena. Then Doom and Gloom, before the request. AsI voted for Let's Spend The Night Together myself, I was quite happy with the choice. 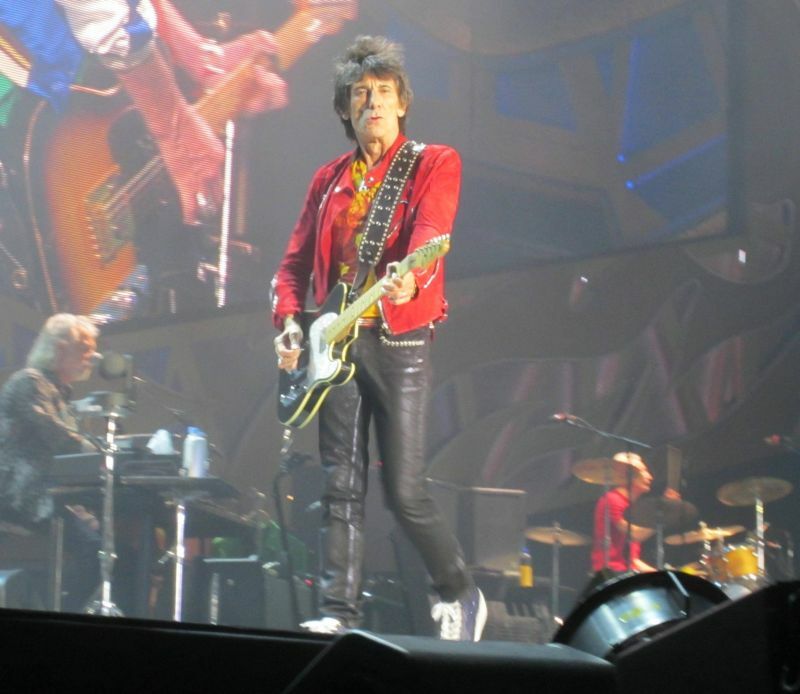 Unfortunately I felt that Emotional Rescue was not a good song tonight, and I noticed that people around me started talking to each other and focus on other things than the stage. When Chuck started banging the cowbell, suddenly the crowd was back in top form again. After the usual presentation of the band (what, Charlie Watts on drums? And Ronnie on guitar???) we get a lovely You Got The Silver, where Keith forgot some of the lyrics, before Can't Be Seen falls totally apart. Mick finds his blues harp, Mick Taylor enters the stage, and from Midnight Rambler the band sounds better than ever. We are witnessing a group of 70 years old men, on top of their career. Absolutely absurd. Miss You is great, and touching when Mick stands on the wings of the stage and sings "really miss you girl", Gimme Shelter, with Lisa absolutely tearing down the arena with her voice, brings tears to my eyes. Start Me Up, amazing, Sympathy better than ever since Get Yer Ya Ya's Out, Brown Sugar equally great and then, far too soon the band leaves, the stage. Tonight's stand-ins for London Bach Choir is Bergen's Edvard Grieg Choir, and YCAGWYW is absolutely fantastic. Satisfaction is the perfect ending to a fantastic night, Mick Taylor gets to play the acoustic guitar as always, and my only complaint on this amazing night, is that we do not get to hear him more. He still is one of my favorite guitar players, and could probably make this concert even better if they chose to let him play a little more. To see the Stones in an arena of this size - "only" room for 25.000 - is a privilege. The sound-system sounded absolutely amazing, the three large screens makes everybody feel close to the band. And the "investment" of golden circle-tickets made everything even more perfect. Luckily, I brought my three kids, from nine to fifteen years old, and all of them will forever remember seeing The Rolling Stones in Telenor Arena. 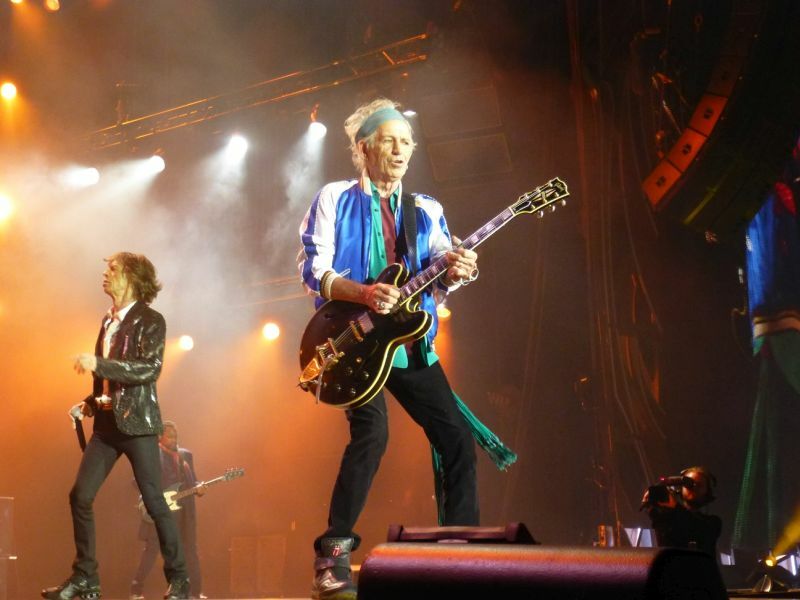 I just have to see the Stones again, later on this tour!!! 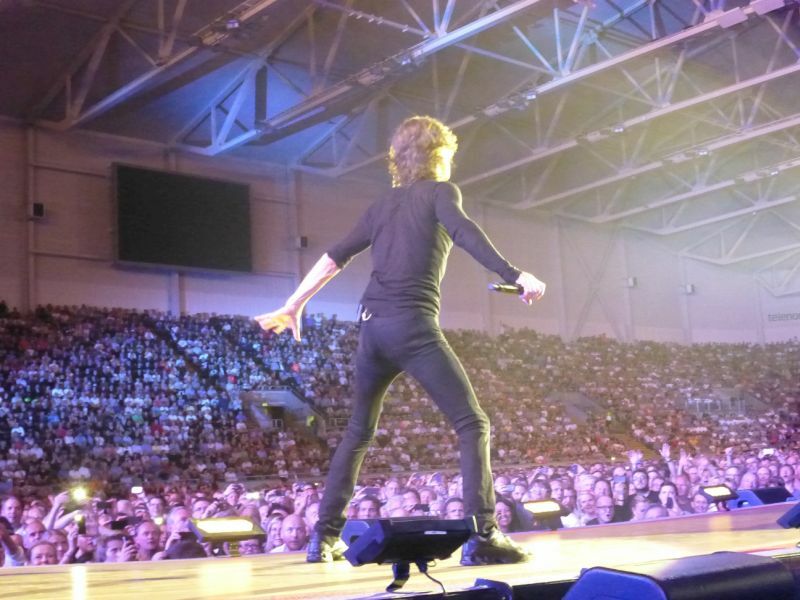 On the basis of this opening night, they could re-name the tour Jagger on Fire. 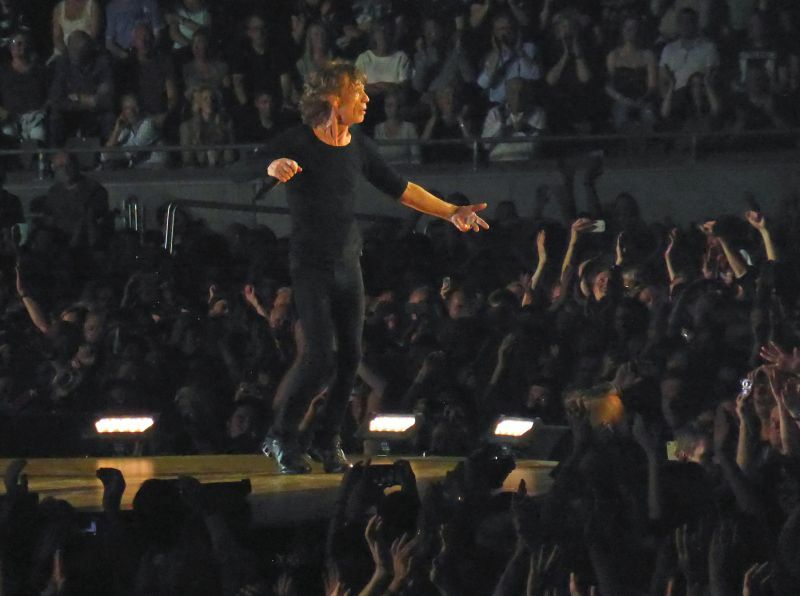 Not that the rest of the band weren't hot, but Mick was just outstanding - singing, emotion, running and dancing. How the f**k does someone pushing 71 years old perform like that for 2 1/4 hours? The Telenor arena is a bit different: football (soccer) sized floor area, one tier of seating; it felt like a mix between a small stadium and an arena on entry. The (new design) stage is stadium width, and is very simple. Travel in and out a little tedious - 30 minute walk to train and massive queue after the gig for the shuttle bus, but very helpful staff - and of course they all speak excellent English. No pushing in the Pit - it is all very civilised in Norway. They even trust you to buy a metro ticket - no gates or barriers. Oslo was full of Tongue shirts - literally hundreds in the centre. Outside the band hotel there must have been one hundred fans waiting for them to leave for the gig - I suspect they used a side entrance, but wasn't hanging around to find out. When the location becomes really public knowledge it can get inconvenient (although the tour programme does name their hotel in Paris!). I'd splashed out on a "VIP" entry ticket to the Pit, which basically allows you in 15 minutes before anyone else, so I was on the front barrier Ronnie's side. Met some very nice folks before and after we entered - an entry that was managed by the Stones head of Tour Security. He walked us down to the Pit, making sure we all walked slowly and didn't get hurt! I'll be buying a Big Bang CD - they rocked. Great as a warm-up act for the Stones, and pretty damn good as a modern rock act, even if they looked like an early 70s band. Guitarist/singer particularly good. They came on right on time at 7.30pm and ended just after 8. The days of sloppy time keeping have long gone. But on came the Stones to JJF. Very loud, very bold, very energized. From the front the sound was excellent - even with my deteriorating hearing I could pick up the very top end keyboard notes when the guitars were delivering 120dB each. Overall impressions: massive passion and energy from everyone. At Singapore, in a small venue, it felt like a theatre gig. The Stones in Oslo, at least from close-up, felt the same. They were up for this re-start to the 2014 tour. I couldn't see Charlie too well as a monitor blocked my view, but Keith and Ronnie were grinning all over; clearly enjoying being back on the road; back on stage. I read someone saying they were a bit sloppy. Well I guess they were just a little - that lovely Exile feel - loose and you can never replicate it if you try it in a band. I prefer the odd stumble: better to get that loose feeling than be note-perfect to the record/rehearsal and then get a too clinical sound. It also brings out the best in intra-group interactions - laughing at each other; helping and encouraging; prompting; watching for the bridge or pace change or ending. Talking of encouraging, I felt that Keith and Ronnie (and I'm sure everyone else on stage and backstage) were "there for Mick" in Oslo. Many looks and glances; touches; mutual grins; even pointing at Mick with a thumbs up from Ronnie at the end; and Keith applauding briefly and he smiled after Worried About You. As Mick's keyboard came out, signaling "Worried", I wondered how this would play on emotions given some of the words. 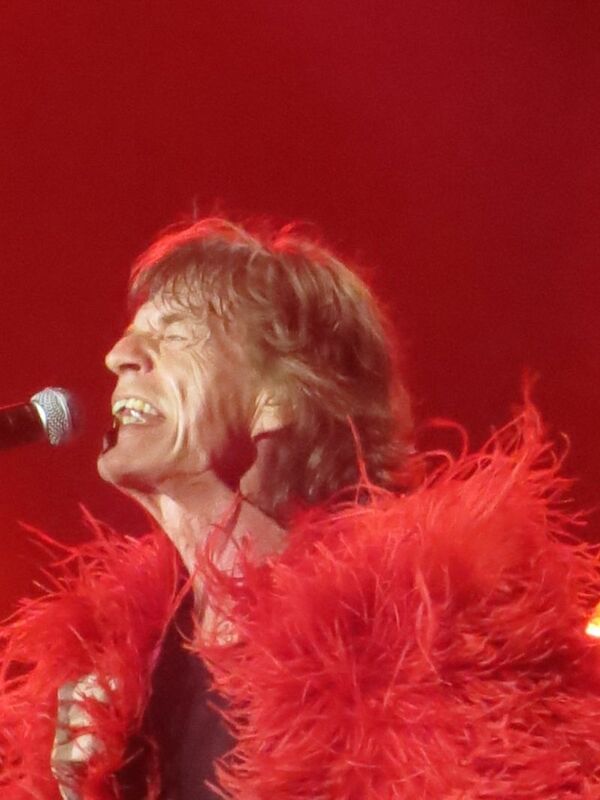 It was brilliant; Mick was brilliant - singing, oozing passion and power. Keith kept close to him, as if in close support like a team-mate close to the goal scorer. Ronnie played a great solo. But mostly it was Mick - a real tour-de-force. 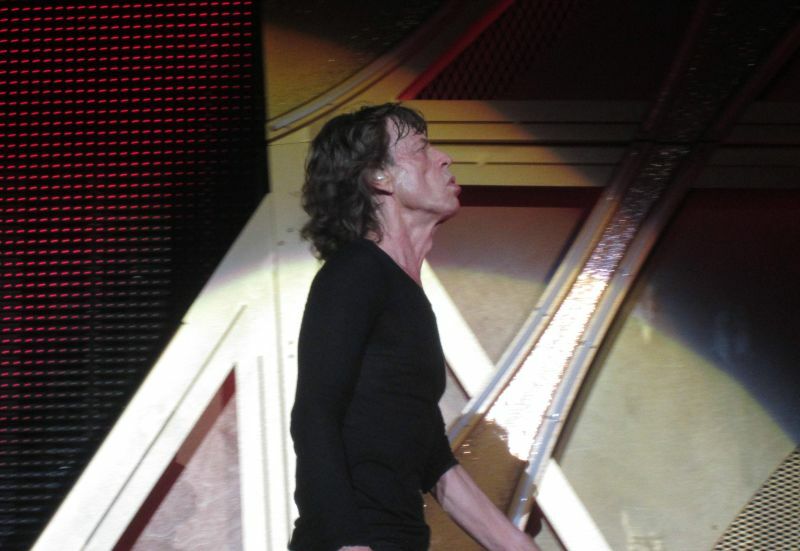 Given the heat in the arena Mick's physical performance was outstanding. His assistant (I think) was close to me, encouraging and making a few notes. That guy is earning his money - and seems to be driving Mick to sustain his overall visual image - so important when you have a big crowd, many watching the big screen. Ronnie and Keith also made some energised moves out on the catwalks; Charlie was tempted to place one foot on it during his introduction (very adventurous for Charlie; great winding-up from Mick). The set list worked for me - OK lots of greatest hits, but they didn't sound boring and lets face it the Stones have 5 hours worth of greatest hits that they could play. Gimme Shelter, JJF and IORR stood out for me. Plus the jammed ending on YCAGWYW. You Got The Silver, Keith playing as well as singing this time, was very nice. Lets Spend the Night Together rocked, and Rambler was sublime and extended. I realized afterwards I'd never heard Can't Be Seen live before (I only did one Steel Wheels gig), and despite the "super loose" playing (OK they lost their way, but good teamwork all ‘round got it back on track) I enjoyed the heavier guitar and delivery. The locals enjoyed plenty of Norwegian comments from Mick, and in fact he was making plenty of easily audible asides - again a looser, more relaxed, performance than I've seen for a long time. He asked at one point, I forget when, for the bass to be turned down - I think in his monitor, and I didn't notice any difference and Darryl wasn't looking upset. Ronnie looked very smug, gesturing about his new grandchild; Keith looked happy and relaxed, but focused; Charlie solid as ever, the occasional raised eyebrows and facial comments across the stage; Mick - I've said enough already. Darryl was as excellent (Mick I think commented how he was "too good"); Chuck smiling a lot and I think more adventurous on some keyboard parts; Bobby motoring; Tim Ries complementing but no real opportunity to shine; Lisa as ever blew away the arena on Shelter, but like Bernard (the expected high standard), seemed to be over-heating at times. Finally, Mick Taylor - only really on Rambler, but really went for it - again more loose and relaxed than I heard the last couple of time. What else to say - well I sincerely hope this level of energy, passion, and slightly less perfection is sustained through the rest of this years gigs and into next. Let it Loose boys. Last night you really, really rocked. The show was brilliant. Sloppy as hell, way too loud and in a room full of echo where the best sound in the house was supposed to be. After a blistering set by the warm up-act, Big Bang, I was curious about how the Stones would follow. One simple answer: By turning up the volume - loud! (And Big Bang was loud as well, mind you). Worried About You was stunning! They had problems ending All Down The Line (which was a fantastic version anyway), and kept on playing forever, before Ronnie wrapped it up by pushing his effect pedal, playing the riff on his light strings to get Keith and the horns on track. A lovely You Got The Silver. I like his other ballads, but on nights like these you'd want him to keep it in the setlist forever. MR was great as always, and Mick Taylor played his a$$ off. He got great reviews in the norwegian press, and the ever-returning question of why they're not using him more was asked again. And now, there is a reason why the warhorses get played everytime! My goodness, how good those songs were yesterday. This Gimme Shelter is up there with the best ones ever. Despite Mick's hearing problems, something he coped with by cutting words and by "speak-singing", his interaction and dueting with Lisa was simply amazing. Of course I'm biased by watching that from a couple of meters distance, but it was lovely - and the crowd was amazed. We know the rest of the set, we heard the songs many times in concert - but when played well, those songs are the best songs in the world - and yesterday they were goose-bumpingly fantastic. I wan't sure if I could write about this show. When you follow every show and you come from some amazing arena shows in Asia, then anything like a stadium or a field will be very different. But I do still feel I should make some comments and reports, because after all this is my home town, and I had the Stones for a week in my neighbourhood. I knew they would move from very private rehearsals in London into still quite private rehearsals in Norway. Last week they arrived, and it was great to have them on my doorstep virtually. I spent every day at the rehearsals, listened to many great songs, and I was dreaming about the final set list that would make me proud. After all, I had a big group of family and collegues coming to the show. I was lucky to see the band members coming and going, and they smiled, game me the sign I needed, and the faith in the fact that the Oslo show would be a turning point. Oslo is my home town, well I live 20 km south-west, which means it is the home town of IORR. For me it is just another stop on just another Rolling Stones tour. But at the same time, I must say, this time it was possible to bring family, friends and collegues. So now they know more why I spend weeks and months away from home every time the Stones go on the road. After the show I asked my grandson age 7 who was the best on stage. I even hinted may be it was Mick, with his singing, or may be Keith, with his riffs, or may be some of the other guitar players. But no, he said. It was the drummer. He was impressed by the drummer. And so am I. Charlie is for sure the engine room, he keeps the pace, he is there from start to finish, nobody to back him up at any times. Charlie was my hero when I became a fan in 1971, and my grandson saw it too, during his first show. Mick was working hard, real hard tonight. The crowd was completly different from the 2007 Valle Hovin crowd. The average age was higher, and they were more quiet. The venue was so hot. Almost like the hottest club shows. We were sweating, the band was sweating. Mick commented on the heat several times. I stayed away from the front of the stage simply because it was boiling hot, it would take away too much energy from the show. Just an advice for the owners of Telenor Arena: An arena needs ventilation and toilets. May be you forgot it during the planning, but the lack of such facilities is simply a big problem when it comes to enjoying a rock show. The first half of the show was like a hard working band with a crowd that was listening but not really getting into it. When Mick introduced the "By request" song he started to sing "Take On Me" by our local group A-ha, by saying it had too many high notes for him. Then we saw "Let's Spend The Night Together" up on the screen. Not a bad voting result! Keith did his set with a strong sideman in Ronnie. I think both of his songs were a bit rusty as compared to his set in Asia this spring, but I like the songs. And it will me more smooth as the tour goes on. Blame it on the heat. The eight last songs were all different. The crowd came to be more live. Midnight Rambler made noise and excitement. Mick Taylor and Mick Jagger face-to-face with guitar and harmonica was making the magic. Miss You - Mick is holding the crowd in his hands. He is playin them. Gimme Shelter, a great live song without limits, it may be as good or as bad as the band and the crowd make it. Tonight it was good and it will be better by the next show on Thursday in Lisbon. No reason to list song by song. The crowd was on and stayed on through the show. Even througn the heat which by now was a pain both for us and for the band. After the show I spent some time waiting for family and friends. I met many locals I know well. My sister and her son bought lucky dip and got Golden Circle. Her message to me was "Great show. Fantastic!" I met many others and all I could see was smiling faces. The newspapers gave the stones 5 out of 6 as a score. Mick worked harder than ever, it was like he wanted to beat the heat, it must have been exhausting for sure, he was drinking water constantly. The stage was great, but if you are sitting on the side you may not see the center screen, because it is far into the stage. But you see the screens on the two sides. 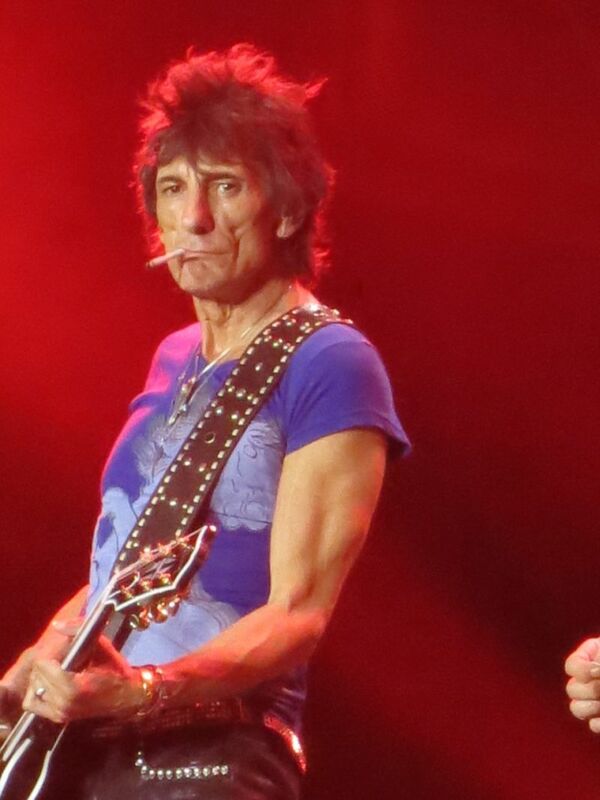 Mick is usning the B-stage a lot, a great place to be, Keith is doing a few brief walks, today mostly on Ronnie side, and Ronnie is mostly staying focused stage center. I was proud of The Rolling Stones tonight. For my family and my friends they were far better than anyone expected. Now I am sure they undferstand why I will away for the rest of the summer, and also later on down under Oct/Nov this year. 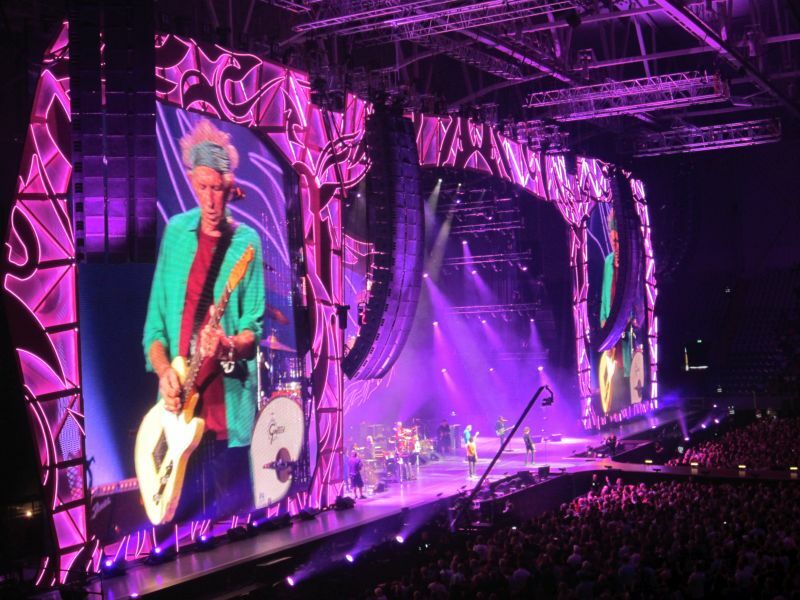 Thanks for making Oslo the Rolling Stones "home base" for a week, a week I will never forget! For a guy whose girlfriend killed herself two months ago, Mick Jagger looked pretty chipper during the opening show of the Stones' European tour in Oslo on Monday. This was no surprise, really. He is the greatest showman on the planet, after all. You almost got the sneaking suspicion that he would have continued with the Australian tour if not for the whole bad taste thing. Mick was more chatty than usual, although he spoke almost as much Norwegian as English, so I can't give a complete account. He actually cracked himself up at one point, after successfully delivering a few complex lines. Perhaps his best line, in English, came just before "Let's Spend the Night Together," the song that won the Internet vote. "I know a lot of you have been requesting Take on Me." And then he sang the title of the A-ha classic for good measure. But he admitted that the song's register was too high. He noted that "Let's Spend the Night Together" was "fortunately one we know. I think!" Now we'll have to see if adapts the same joke in every country. It would be nice if the Stones did cover a local hero's song, just like Springsteen did. The only time I wondered if Mick might be thinking about L'Wren was during "Worried About You" with lines like "just like that burned-out cigarette" and "Why'd you do that for, baby?" and "vanish like a dream." But that song, for me, was the highlight of the show. And maybe for Keith, too, who smiled and applauded at the end. When Mick introduced the song by saying, "This one's called Worried About You," it seemed I was the only one who cheered. Elsewhere, it was crickets. Maybe it was because the crowd was really young. Or drunk. Or dead. Actually, the crowd was pretty dead for the first half of the show, though the Stones didn't help matters with a very weak start. Set opener "Jumpin' Jack Flash" was shockingly pallid and "It's Only Rock n' Roll" was its usual boring self. I wondered if the rest of the show would be a similar drag. 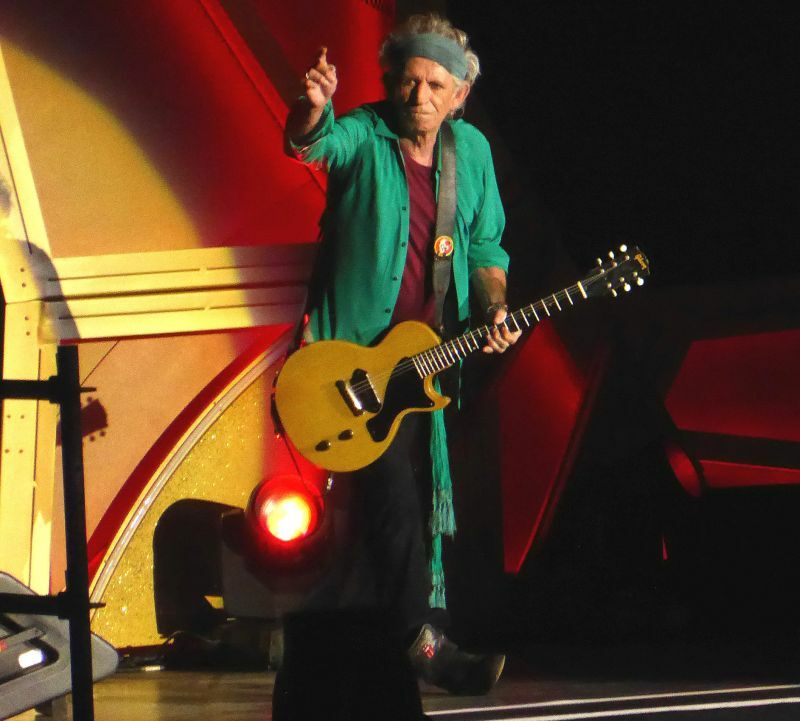 The Stones do no favors to "All Down the Line" by pairing it with the video showing old blues and rock legends, with the redundant captions. "Yeah, we know what Bob Dylan looks like. No need to tell us." The people in the pit were so distracted by the footage that they failed to notice that Mick was a few meters away on the walkway. Oddly, "Doom and Gloom" seemed to get more recognition from some young Norwegian girls standing in front of me than anything up to then. And I noticed some people heading to the concession stand during "Emotional Rescue." Maybe it was two falsetto songs too many. Also, it was terribly hot inside the Telenor Arena, a rather large and unimpressive place, like a giant high school gym with flat roof and one tier of seating. Several times Mick complained about the heat, and he had to motion mid-song to his roadie to fetch him a towel. He did not use any of the jackets, but did pay homage to L'Wren by wearing the hideous coat she designed for "Sympathy for the Devil." It makes him look like a human feather duster. Keith was also sweating a lot. Maybe that's why he forgot most of the words to "Can't Be Seen." Halfway through the inadvertent instrumental, Ronnie came to the rescue by taking over from Chuck as bandleader and signaling to Bernard that he needed to sing something. So Bernard came in with "Set us up so they can shoot us down" and things got back on track. Ronnie also shone on "You Got the Silver." Keith thanked him and added, "I love to play with him." This must have earned a saucy comment from some fan up front, because Keith quickly added, "I didn't mean it like that!" I noticed Matt Clifford playing keyboard alongside Chuck on "Can't Be Seen," bringing back mixed emotions from the Steel Wheels/Urban Jungle era. The low points, for me, involved Lisa Fisher, who has taken over from Chuck as the most entitled wannabe Stone. I was shocked when she walked halfway down the walkway by herself at the start of "Gimme Shelter," and stayed there when Mick came down. She doesn't even try to approximate Merry Clayton, and the audience didn't seem too enthusiastic. She also hogged the spotlight during "Sympathy" and drowned out Mick and the Edvard Grieg Youth choir with her strained soprano acrobatics and wild hand gestures and facial tics. It is really becoming uncomfortable to see her. Bernard does the heavy lifting in a less-showy style. Mick Taylor is the new Blondie, playing acoustic on "Satisfaction." But he co-owns "Midnight Rambler" with Mick Jagger. It's wonderful to see the old pals reunited in an intense face-off. Pity it's not for the whole show. So, overall, a bit shaky, as to be expected. Things should improve rapidly from here on. 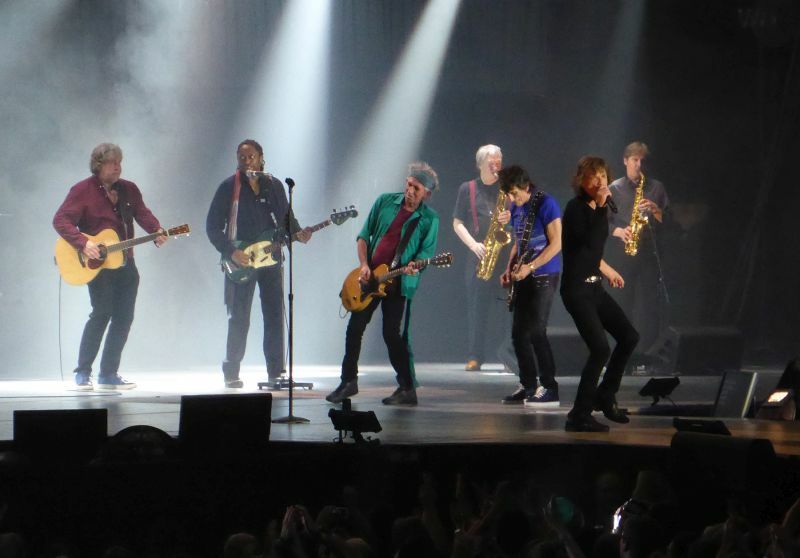 May 26, 2014, exactly 19 years after the famous Paradiso show, the Stones kicked off their European tour in Oslo. Their first concert in Oslo since 2007 and their first concert after their cancelled Australian tour. Manfred and I were ready for a great night with the greatest rock 'n roll band in the world. Exactly at 20.30 they hit the stage and opened with Jumpin' Jack Flash. Audience went absolutely crazy. It's only Rock 'n Roll was next and Oslo certainly liked it! Then the first variabele from the show: All Down the Line, great song performed well followed by another Exile song: Tumbling Dice. Then a song they don't play often: Worried About You. Really saw some emotion from Jagger here...Keith nodded to Jagger that he did well... must had to do something with Jaggers recent tragedy... The audience applauded loud after this song and Jagger said "Give it to me" and the Norwegian audience did, what a great support... . amazing... . highlight of the evening! 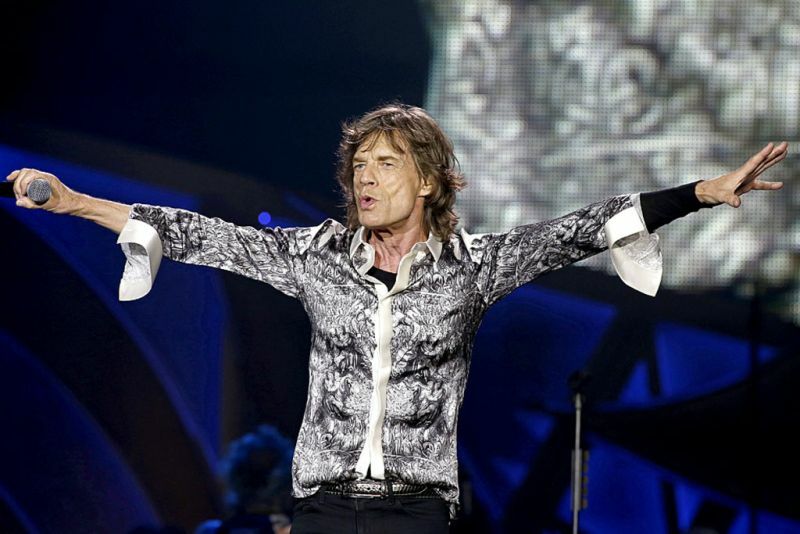 After Doom And Gloom we got the web choice: Let's Spend The Night Together; Jagger commented: " At least one we know" The crowd loved it and also the many Norwegian words Jagger spoke the audience during the entire show. It got warmer and warmer inside the stadium and it wouldn't take long before the first people started fainting. 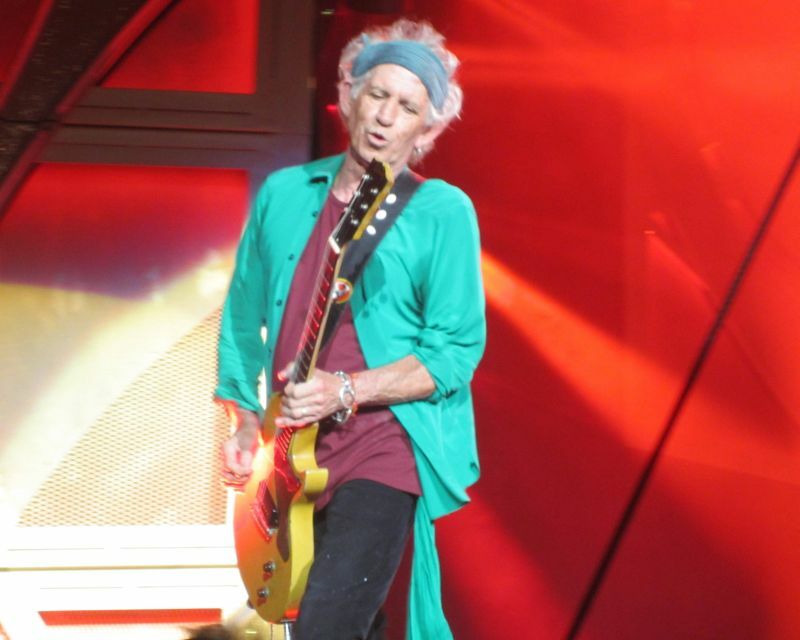 After Honky Tonk Women we got a new Keith' set: You Got The Silver and Can't Be Seen. On this one Keith missed the words and didn't know what to sing so the song continued for quite some time without lyrics and Ronnie walking to Chuck and Keith a few times and finally the song got picked up again... what a great band, loved this! The we got a great version of Gimme Shelter with a lot of passion between Mick and Lisa. It was great to see Mick so enthusiastic, full of energy and performing so well this night. 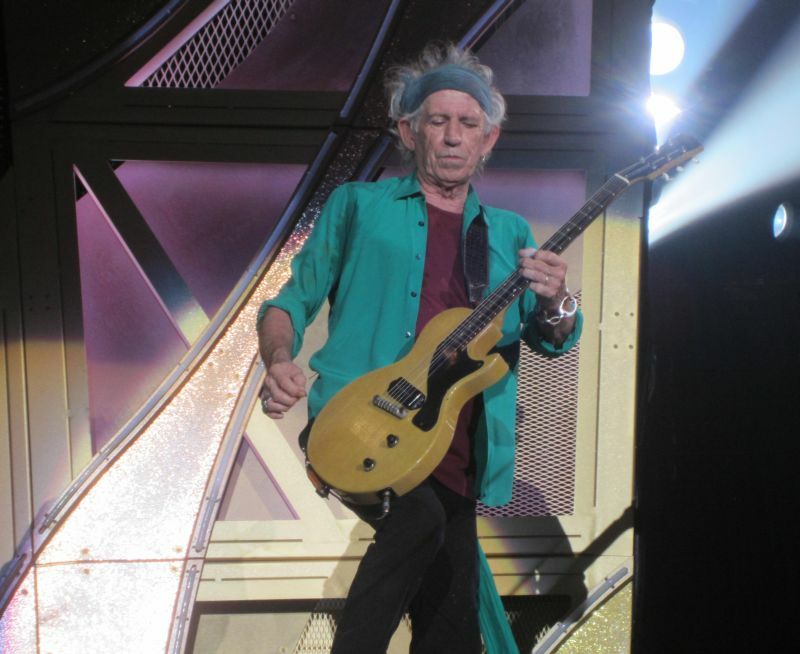 After Start Me Up we got Sympathy For The Devil: loved Keith' loud guitar: Pleased to meet you, hope you guess my name! Next was Brown Sugar and as chorus You Can't always Get What You Want, an extended version with some extra piano, drums and guitar work at the end... .great) and Satisfaction. We had a great evening and witnessed a stunning show with a great audience. Thank you Rolling Stones, thank you Norway. It started with a bang. Keith's guitar sound on JJ Flash was immense. The sound was a bit blurry sometimes during the show, but most of the time it was great (and loud). Mick was fantastic throughout the show. He was as energetic as ever before. Worried About You was a great gem to hear live. Mick did a fantastic job on that one, and the crowd responded well. I didn't want LSPTNT to ‘win' the vote, but it worked very well with loud guitars upfront. Emotional Rescue didn't work that well I think, the crowd didn't seem to be into it, although Mick did a great effort. Also nice to hear Can't Be Seen. It started off really well, but Keith lost his way in the middle of the song, not singing the second verse and chorus while standing there a bit confused, and was only saved by the bridge that came in too early by the band just to get him back on track. Apart from that, Keith didn't to any notable ‘mistakes'. The overall energy and intensity throughout the show was remarkable. Can't wait to see them again! 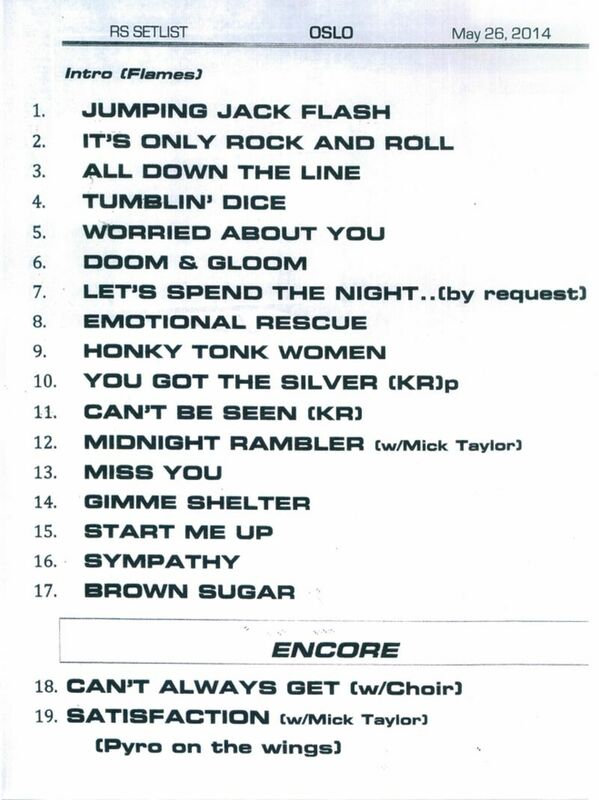 Just hope they give Mick Taylor another spot in the set list. 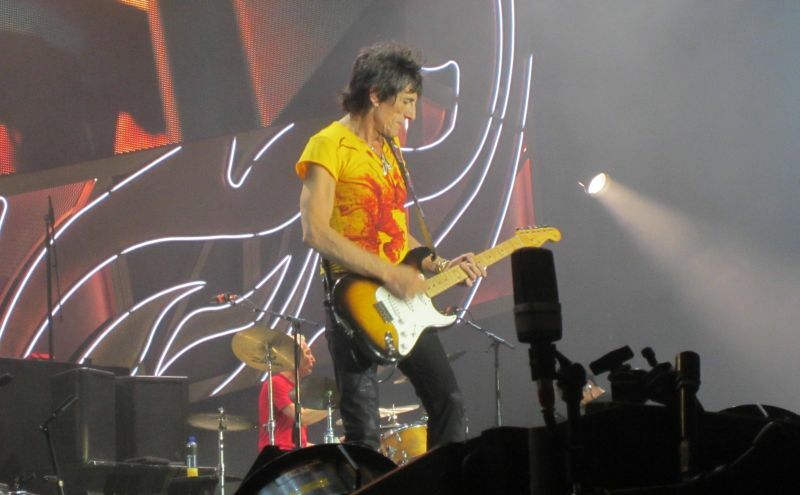 A week where I was at four rehersals, met several iorrians, had a chat with Taylor, fischer, keys and fowler, saw one of the best shows I have ever seen of the Stones and made it to FOS, ended with getting one of the setlist from the stage. That one is to be framed and hung on the wall. The Oslo concert was a good one. Despite the very high (and sometimes bad) sound and bad acoustics in the arena (and VERY hot), the performance was a very good one. As others have written there were some sloppiness and mistakes here and there but that's part of the game, and nothing that destroys the experience of a good performance and a band on fire. On a good night, this is still (one of the) best live band(s) in the world. The opening chords of JJF cut throgh the air like a razorblade, and a very good version too which promised good for the rest of the night. 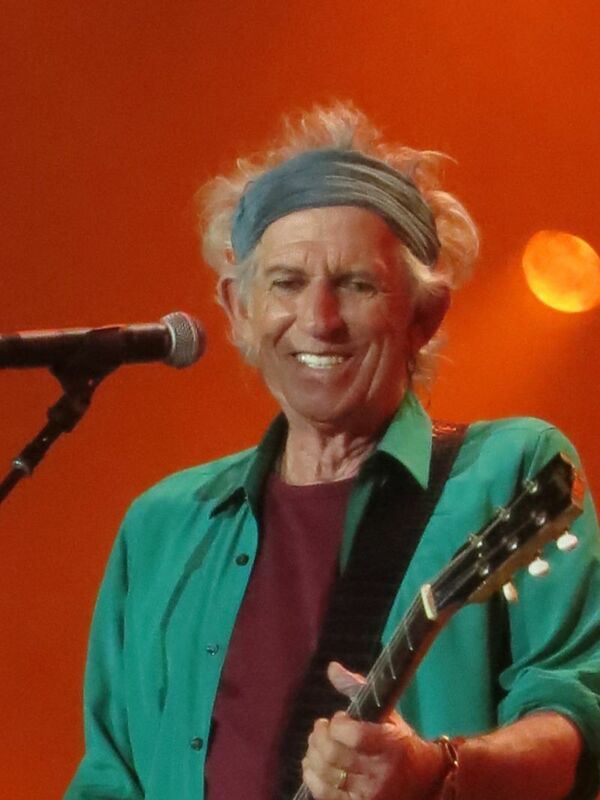 Mick (an also the rest of the band) did a very good performance on Worried, and Keef touched him, smiled and almost joined in on the crowds applause after this. A very fine moment between the two of them. Honky Tonk Women was another highligh tonight. Sometimes it is boring, but here the groove and the drive was there right from Keiths damned good feeling on the opening riff. 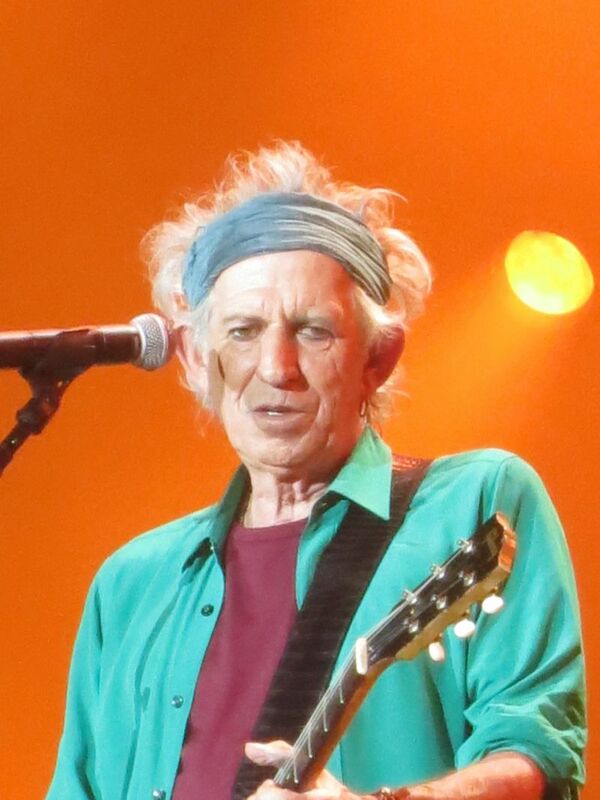 Keith did an ok solo, but a few strange bum notes. Mick walked over to him, gave him a smile(?) and said something to him. They looked like good old friends. 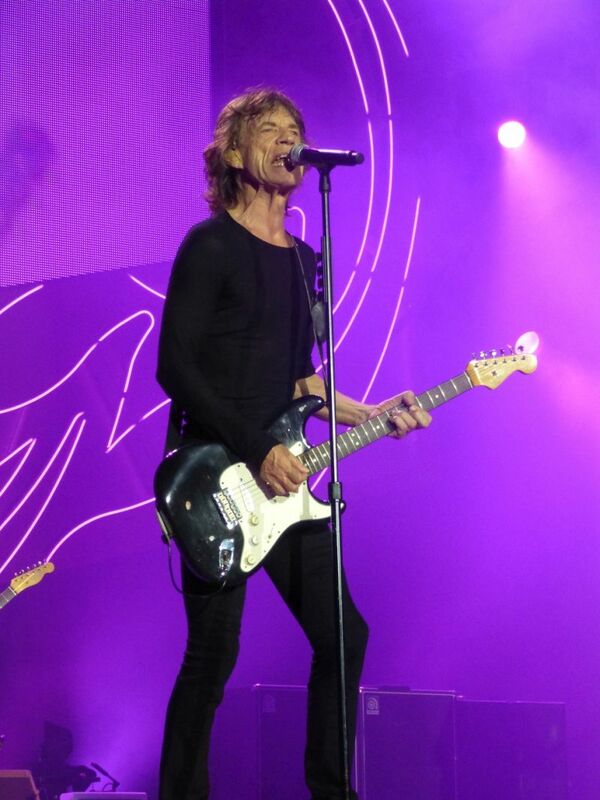 Mick performed extremely well, talked, smiled and was in good mood and seemed to enjoy beeing on stage again. Ronnie did his job, played well, interacting with Chuck and pulling things together when needed. Espicially on Can't be seen, and bringing home All Down The Line that just kept on and on. Keith was focused and played well. Charlie was good as always. During the introduction Mick got him a few meters out on the catwalk before he resisted, and Mick commented 'That's as far as he goes'. I was standing in GC, Ronnies side near the catwalk and not too far from the stage Mick used to catwalk a lot. Keith and Ronnie was out there on Miss you, Keith on Sympathy too. And Lisa on GS. The band seemed to to have a really good time. Lots of smiles, nods and interactions between the members. The really seemed to enjoy beeing on stage together again. Yesterday night I came back from Oslo (and, by the way, I found it sunny and beautiful). Apart from some mistakes in some songs (Can't be seen...) I found the Band in a very good form, "hungry" and motivated. I saw Stones for the first time in Aarhus, Denmark, in September 1970. Over the years I have seen them 8 or 9 times, so my wife and I had to take the ferry to Norway for the concert in Oslo. Is was just great (but a bit sloppy in the first numbers). But after that - what a show. I will not comment on the harsh times for Mick Jagger, that is private for him. But beside that, I noticed that Keith was in full harmony with the music, and the interaction between Keith and Mick was totching to see. And for me very nice to se Mick Taylor up there. I will not write more than this - it was all just beyond words. What a fantastic and hot night it was! Arrived in Oslo around 1PM and then went to Telenor Arena, lot´s of people there in the afternoon. Started to queue around 4PM, many people from around the world, Japan, USA, The Netherlands, Belgium, UK and so on. Everyone was there to see the worlds greatest rock n roll band this evening! Doors opened at 6PM I was around number 50 in the queue and ended up front of stage near the catwalk Ronnies side. The Norwegian opening band was really good and then 8.30PM the show started with a great version of JJF!!! Finally the boys were back on stage after two months of grief. 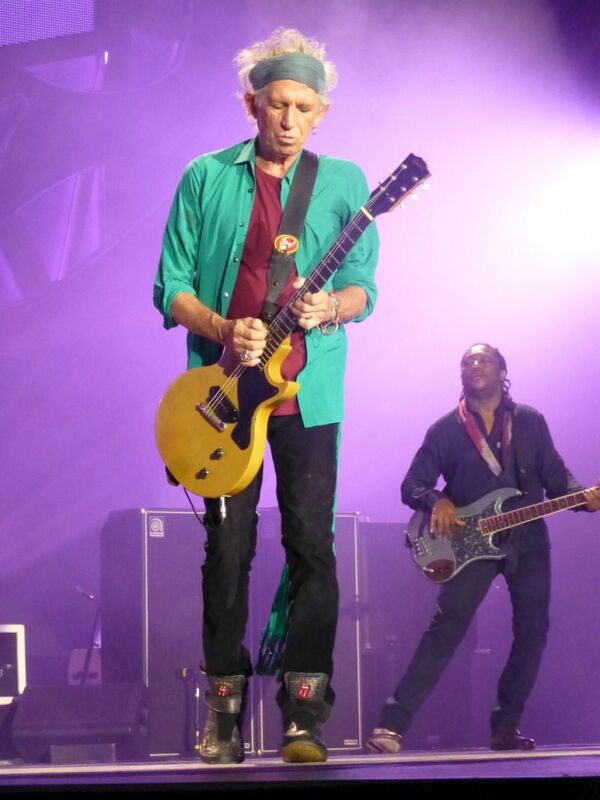 Mick looked really great and Keith and the rest of the band played good except for a few small mistakes from Keith. Overall this was a very promising opening night with a big highlight WORRIED ABOUT YOU! They did a fantastic version that I will remember for a long time. Also nice to see that they are changing songs in Keiths set, this night we got to hear the these days rarely played can´t be seen. The boys are already in good shape, really looking forward to the next show for me which is Landgraaf and then of course Berlin, Paris, Werchter & Stockholm as well! What a great month it will be, see you all on the road! Oh, thank God for Mick Jagger! Damn! He looks great! Love his new clothes! Greatest surprise of the day is the STAGE. Simply beautiful! 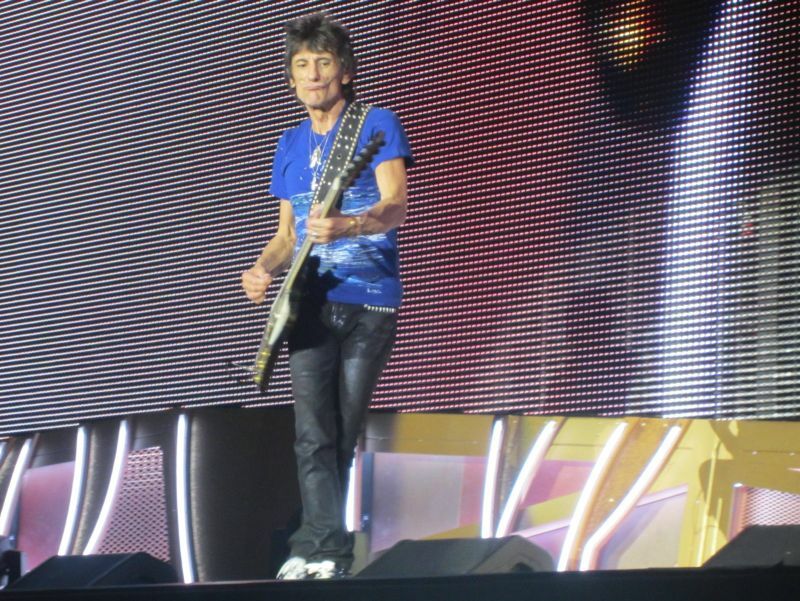 The Oslo show was to be my 7th Stones show - but my first outside of the UK. We arrived the morning of the show and could already sense a buzz of excitement around the streets that only intensified as show time got closer and closer. We had GC tickets on Ronnie's side and managed to get within the first 5 rows - the stage looked simple - but effective (and to be honest who cares what the stage is like once the stones have taken to it?). I must say Big Bang were a great warm up act and got the crowd ready for the main event..
A strong opening, a combination of Charlie's drums high in the mix and starting with a real crowd pleaser ensured the night started with a lot of energy. The arena was hot - so was Jagger - furiously waving for a towel as he encouraged Chuck and Charlie to ramp up the speed at the start of Tumbling Dice. I was delighted to hear Worried About You - I think it shows Mick at his finest - the back of the arena set off a really strong and spontaneous clap that he responded to - I think in the indoor arenas this song really works! Let's Spend the Night Together worked really well, while the attempt at Can't Be Seen perhaps less so(!) but it was great to hear them try something different. The 2nd half of the show provided hit after hit, YCAGWYW with an extended ending and Satisfaction closed off what was a great show (but aren't they all!). Although we all would love to hear certain songs, I can fully understand why the stones stick to this formula for their setlist - you can see (some) people looking confused when the stones start playing semi-big hits like emotional rescue and all down the line - just imagine how hard Mick would have to work to keep the audience involved if they were playing lesser known songs. Dagbladet.no : It's rock and roll and we like it The Rolling Stones innfridde i Telenor Arena mandag kveld. OsloBy.no: Alle satisfied til slutt - Om dette var siste runde med gjengen, gikk The Rolling Stones ut i full fyr. 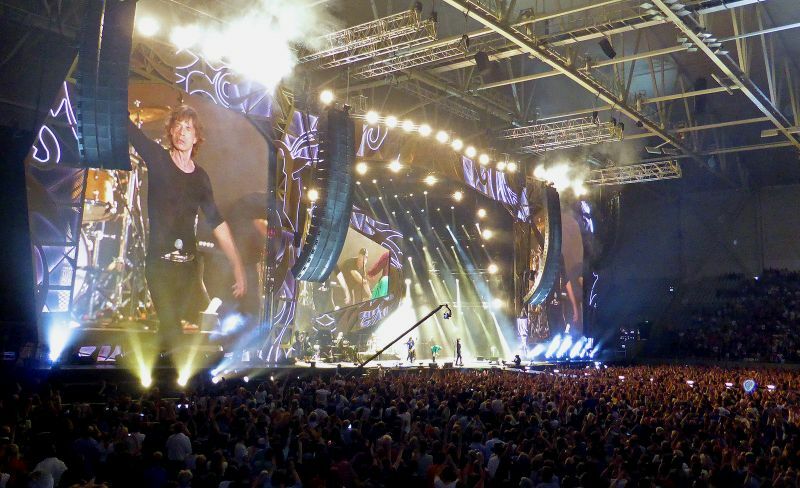 Aftenposten.no with Jumping Jack Flash bit video - Slik hørtes The Rolling Stones ut i går The Rolling Stones fortsatte sin verdensturné i Oslo mandag kveld. Se smakebiter fra konserten.